The Adventure Highway really is at it is called \"an adventure\". The road has improved somewhat over the last 5 years and now has some quantity of bitumen and will no doubt become totally upgraded in the years to come. The surface upgrade has given access to all travellers opening up interestin and historical areas like \"The Dig Tree\", Jackson Oil fields and the Infamous and historical Noccundra Hotel. 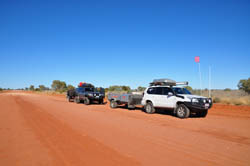 The road ends at the QLD SA border but also provides a rougher track access to Innaminka and the Eastern parts of the Sturt Stoney Desert. Although an easy run I reccomend this journey to anyone with the outback travel bug and use this track to supplement and open door to the far West of this great country.